How to Remodel Your Bathroom without Breaking Your Budget – Part 1 of 2 - Nowthen Plumbing, Inc. Your bathroom may be desperate for an update, but a major remodel is simply not in the budget. What to do? Here are some great tips for taking on a bathroom remodel without breaking the bank. If you’re not desperate to add square footage, keeping the same footprint of the bathroom you already have will save you money in demolition and reconstruction dollars. You’ll eliminate excess dust and debris while you’re at it, not a bad bonus. Making the most of your space means plumbing fixtures are easier to locate near already existing pipes and the basics can all go in the same place, easing the timing and the process. Click here for some inspiration on smaller bathrooms with organization and style. If planning isn’t your strength, this is a good place to dish out the dough and hire a designer — a decision which will add style and efficiency to your bathroom remodel project. Get your design nailed down from the beginning and resist the temptation to change your mind, which can stall the project and cost you extra money in the long run. You may think you need that expensive Italian tile, but maybe all you really want is a touch of the color blue it comes in. Using lower cost, neutral tiles is long-term-friendly and allows you to add zest to the room with non-permanent touches, such as luxury towels, a designer shower curtain, and wall paint, in any color your heart craves. Peak at some ideas for keeping it classy while using neturals in your decorating here. Getting excited about the possibility of remodeling your bathroom for a price you can afford? 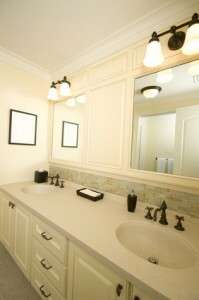 Follow us next month for part 2 as we share three more ways to save big on your bathroom remodel. Need some plumbing assistance as you remodel your bathroom? Contact us at Nowthen Plumbing today! Serving the surrounding areas of Elk River, Anoka, and the south & east suburbs of the Twin Cities.